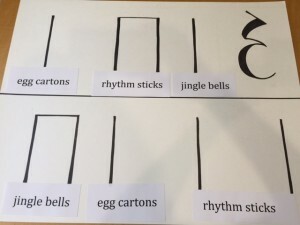 What can you do with egg cartons, rhythm sticks, and jingle bells that the children love? Put a poster like this at the front of the room. Don’t put the names of the instruments on it for the younger children. 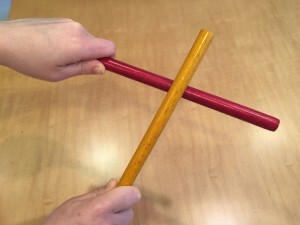 Demonstrate the first line of the rhythm for the children by tapping on your lap (called a patsch). (Note: Lift your hands far up off of your thighs on the rest to show dramatically you are not tapping. You can say Ta, ti ti, Ta, Sh as you are tapping. You are only doing the first line, not the second.) Ask the children to patsch (tapping on their thighs with the palms of their hands) the rhythm with you as you point on the beat and patsch with the other hand. Sing the song and play the rhythm on their instrument. When you finish, ask the children to trade instruments with someone else. Sing and Play the rhythm once again. Use an instrument and do the rhythm. Ask the adults to pass out an instrument to each child. Ask all of the egg cartons to play once. Now ask all of the rhythm sticks to play once. Ask all of the jingle bells to play. Tell the children you will sing while they play the pattern on the poster above. Sing the verse as they play the pattern. Call out “Freeze!” Tell them you are switching to the second line for the chorus. Ti ti, ta, ta, ta. Have them practice, only playing their instrument when it is marked. Sing the chorus and play the pattern. Tell the children you will be singing the whole song as they do the rhythm. Remind them to switch lines at the chorus. Sing the song, pointing to the pattern as you sing and the children play. As an extension, ask the children to switch instruments. Sing and play the song once again. The children are challenged, active, engaged, and hearing this song over and over again in a fun way. The words go automatically into the back door of the brain’s memory. I’m a little confused on the beat pattern with the words. Can you explain a little more which beat above goes with what words in first phrase? Ok, I now get the younger instructions using only the first card, but I am confused on the older instructions when singing the chorus with the second card. Can you possible show what words with the pattern? I have “I will go ” with the ti ti ta and “I will do” ta but then there’s still one more ta in the pattern and that is not fitting for me. Ok I practiced it without thinking so much and I think I have it…. I (ti) will (ti) go (ta) I (ta) do(ta) Whew! I’m so impressed with your commitment to learn new things and to do whatever you need to do to help the children. Thanks for reaching out! I am assuming that the cards with instrument and notes are for teaching the whole song to the older and that they don’t start out like the younger playing all notes together but only play their instrument when it is assigned. I can see this as tough even for the older kids and wonder if it would be helpful to have an adult for each instrument at the front of room to be the leader or older child? Yes, the older children do the whole rhythm with you on their lap or clapping first, then they only play when their instrument comes. I point each beat so they don’t get lost while I’m singing. And yes, it is helpful to call for a volunteer to come up and play that instrument as the leader. Sharla, with the younger are you pointing to the pattern the whole time or do you pick an instrument and do it with them ? This and other activities are going to happen in my class today at BYU-I! Thanks for all of the info, and thanks again for coming up here! This looks like fun. I can’t wait to use it!